You will find a selection of media in German language and in translation in the library: books, magazines, films, music, apps and games. We have excellent special collections in our focal areas of philiosophy, psychology, contemporary photography and architecture. 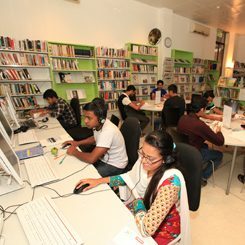 The eLibrary is a digital service offered by the Goethe-Institut Dhaka library for Bangladesh which allows you to borrow digital media.